Rs 22 crore (Rs 220 million) -- that was the total value of exports of IT software from Andhra Pradesh in 1994-95. IT exports in the state have now crossed Rs 32,500 crore (Rs 325 billion) during 2008-09 and poised to grow up by another 20% during the current financial year. However, recession in the United States and the global economic slowdown now seem to be catching up with the information technology industry in Andhra Pradesh as well as other parts of the country. While the growth rate of IT/ITeS exports from Andhra Pradesh was an impressive 41% during 2007-08, last year it came down to 24.5%, say the annual tentative results declared by the Software Technology Park of India, Hyderabad. Apart from the IT/ITeS companies, the Special Economic Zones of IT/ITeS firms also come under the purview of the STPI, Hyderabad. In another indication of the slowdown in the expansion of IT industry in the state, only 69 new companies were registered during the year as against 176 in the previous year. 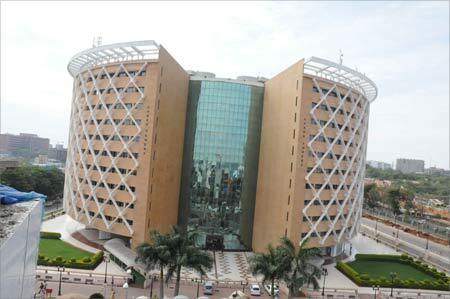 Image: The HiTech City in Hyderabad. According to P Venugopal, director, STPI, Hyderabad, fresh projected investment in the state was Rs 510 crore (Rs 5.10 billion). 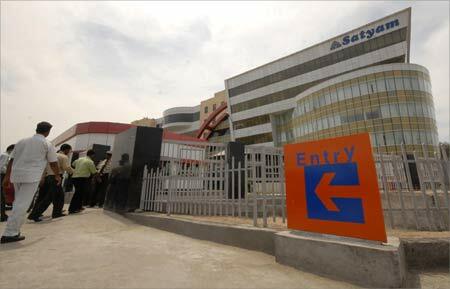 The massive Rs 7,800-crore scam in Satyam Computer Services, the biggest IT company in Andhra Pradesh, came as a further blow to the industry during the year. However, this is not reflected in the tentative results of exports from the state. The results continue to put Satyam Computer at the top of the list of exporters with a total exports of Rs 4,231 crore (Rs 42.31 billion) during 2008-09, a growth of 27% higher than previous year. "As and when the accounts of Satyam Computer are restated, the over all figure of exports will also change but we don't expect it to be more than five to ten per cent," said M Gopi Krishna, special secretary, information technology and communications, Andhra Pradesh. The picture was no different at the national level as far as the growth of IT industry was concerned. According to N Krishnan, director general, STPI, the exports by IT/ITeS and SEZ units all over India was more than Rs 222,000 crore (Rs 2,220 billion) this year as against Rs 185,000 crore (Rs 1,850 billion) during 2007-08. The over all growth rate this year was 20.65 per cent. Image: Employees of Satyam Computer at the company's head office in Hyderabad. The current financial year was likely to see some more adverse impact on the exports. Studies by some independent agencies suggest that the growth rate will be between 12 to 15% during the current year and it will remain at 12.7% till 2013. The significant position the IT sector has come to occupy in the economy of India and Andhra Pradesh reflects in the number of direct and indirect jobs created by the sector. There are 22 lakh (2.2 million) people directly and 79.2 lakh (7.92 million) people indirectly employed in the sector throughout the country. In case of Andhra Pradesh the number was 251,786 and 906,430, respectively. The Indian IT sector made a contribution of 3.83% to the GDP of the country during 2008-09. On positive aspect of the emerging situation was that the IT companies of Andhra Pradesh were reducing their dependence on the US market. 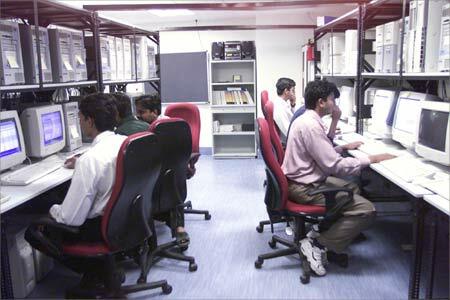 Image: Software engineers work at the Microsoft India data centre in Hyderabad. The IT software and services export to the US and Canada from Andhra Pradesh was 52% this year compared to 69% in 2005-06. "It is a good indication that the exports to the other regions of the world are increasing," Krishnan said. L Suresh, secretary, Hyderabad Software Exporters Association, said that there was tremendous potential for the Indian IT companies in the domestic market as the government has said it will invest Rs 1 lakh crore (Rs 1 trillion) in e-governance project. "The national identity card project is just a beginning," he said. The figures also suggest that Hyderabad remains behind Bangalore and Chennai in the matter of IT/ITeS exports. However, Andhra Pradesh has scored in the number of SEZ for IT/ITeS companies. Of the total 350 IT/ITeS SEZ approved, 59 are in Andhra Pradesh with a proposed built-up area of more than 6.5 million sq mts. Of this, 447,000 sq mts has already been built in different SEZs. Apart from Hyderabad, the government of Andhra Pradesh was also trying to promote the tier-II cities like Visakhapatanam, Vijaywada, Tirupati, Kakinada and Warangal as the new destinations for the IT/ITeS companies. 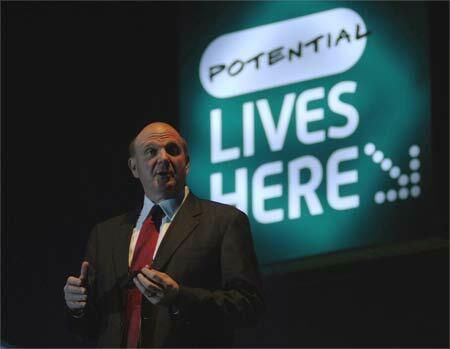 Image: Microsoft CEO Steve Ballmer at the Microsoft Tech.ed India 2009.